â€¢ Seeing Erik Larsen walk up to the booth to chat. Get this; the guy wasn’t there manning an Image Comics table, or hawking copies of his latest Savage Dragon releases. He was just wandering the floor, incognito, scoring cool old (and I mean OLD) comics. The joke was he had purchased a copy of CRACK, then a copy of SPEED… what’s next, LSD? He’s got interesting plans for them, which I’ll leave to him to divulge. â€¢ The TwoMorrows Panel was well attended, featuring Roy Thomas, Chris Irving, Eric N-W, Michael Eury, and yours truly. It was a lively hour (actually, we went a little over that, cause we had so much fun stuff to talk about), with Roy Thomas stealing the show, telling how he walked into Marvel one day and got handed a $40,000 check for royalties on SECRET DEFENDERS #1 (a title which no one in the crowd remembered; Roy barely did). But it was the biggest royalty check he ever got in comics; such were the speculator days of the early 1990s. We also dished about what was in our new Catalog Update, which’ll be inserted in all our July magazine issues, and be available for downloading (and free copies mailed upon request) in a couple of weeks; it spotlights all our new releases from now until early 2008 (including my top secret plans for Jack Kirby Collector #50). â€¢Â Meeting Rough Stuff editor Bob McLeod for the first time face-to-face. (Actually, I met him over 20 years ago at a convention in Atlanta, when I was still in high schoolâ€”not that he’d remember a snot-nosed kid like me that long ago.) We’ve been working together on the mag long-distance via phone and email, but never got to meet in person until this weekend. Great guy, who was doing the most amazing sketches (he had just a long list of people wanting them, he had to beg off being on our panel, to save time to get all his art done). â€¢ Hanging with Michael Eury and his lovely wife Rose. Their big news is that they’re planning to move back to North Carolina later this year, which is welcome news to me that he’ll be so close. Coincidentally, Michael Kronenberg (Mr. Eury’s co-writer on the upcoming Batcave Companion) is also moving to NC within the next month, so it’s looking like our little state is getting to be more and more a hub of comics activity (Newsarama is also headquartered here, as are a lot of top artists). 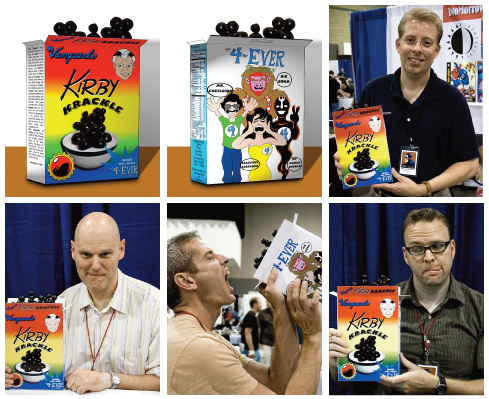 â€¢ A fan (whose name I can’t place, but they’re supposed to be emailing a photo soon, which I’ll post) brought over his handmade box of “Kirby Krackle Cereal” which you’ve gotta see to believe. Stay tuned for the photo. Somebody oughtta market an actual line of cereal with that name. This entry was posted in TNT on 17 June 2007 by Mr. Morrow. George Khoury really covered Image Comics from beginning to now in his most exhaustive book to date. Check it out! This entry was posted in TNT on 14 June 2007 by Mr. Morrow. Our able Modern Masters editor Eric Nolen-Weathington dropped by today, to pick up a load of our books to take down to Charlotte, NC for this weekend’s Heroes Convention. It’s a great con, and right in our own backyard (about a 2.5 hour drive), and Eric and his wife Donna are manning the booth for us as usual this year. This is one of the best cons going; not too big, but not small by any means. It’s this Friday-Sunday, and Saturday at 11:30am, Roy Thomas, Michael Eury, Chris Irving, Bob McLeod, Eric, and I will be hamming it up on the TwoMorrows Panel. So if you’re down our way, stop in for a great time! Shelton Drum, the con’s organizer, holds the event on Father’s Day weekend, with free admission on Sunday for kids with dads; a great way to get more kids into the whole comics scene. However, Roy Thomas and I will both be there for Saturday only, so don’t forget to stop by our booth Saturday to get something signed by Roy, and to see me doing whatever it is I do at these things. WARNING! We just got in three (count ’em, three) copies of our new book IMAGE COMICS: THE ROAD TO INDEPENDENCE as samples from our printer. The rest will be in next week, but we’ll only be selling two of the copies at Heroes Con, and saving the other for a display copy. So if you’re just dying to read this book, and can’t wait until it hits stores next week, get there early! Never too early for San Diego! I’ll have more specifics about who’s on each shortly, and we’ll have our multimedia presentation of upcoming TwoMorrows stuff during our own panel. Can you believe it’s time for Comicon already? I can’t wait! This entry was posted in TNT on 11 June 2007 by Mr. Morrow. The long-completed documentary JACK KIRBY: STORYTELLER is finally available, as one of the extra features on the Fantastic Four – Extended Cut (Two-Disc Special Edition) DVD which was just released in advance of this week’s debut of the new Rise of the Silver Surfer FF movie sequel. It’s an hour-long celebration of the King of Comics, featuring a nice bio and tributes by a who’s who of comics professionals. (My couple of talking-head cameos in the documentary didn’t even seem to ruin it, so you know it’s got to be good.) Even if you didn’t like the first FF movie, this documentary alone is worth the $19.99 the DVD costs. (And if you’re planning on seeing the FF Sequel, the DVD includes a coupon good for a free ticket to see the Silver Surfer filck.) You can get it on Amazon.com here. Why, some may ask, is TwoMorrows doing a book on the history of Image Comics? Besides the fact that we’re committed to documenting ALL of comics history, I admit I wasn’t a big fan of the early Image Comics output. Heck, I was completely out of comics altogether when Image first launched. It took Jack Kirby’s death in 1994 to get me back into a comics shop to even discover the company existed, after a 5-year hiatus. But that first trip back to a comics store really made an impact. After wading through all the foil-stamped cover variants from Marvel and DC, I saw the big “i” logo on a comic, and had to ask the shop owner what “Image” was. At that point, I had no idea how influential those seven founders had been in the marketplace during my absence. I’ve since learned a lot about the company and its founders (or so I thought, until I read this exhaustive book). My first Image comic purchase was when Jeff Smith moved his comic Bone to the company briefly. Since then, Image has published some of the best comics in the business, and while they’re not selling in the millions of copies any longer (who is, these days? ), they’re all about quality output. 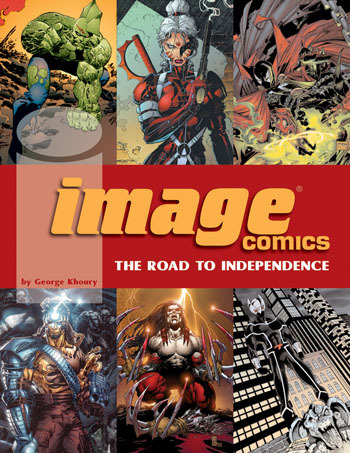 Author George Khoury’s book IMAGE COMICS: THE ROAD TO INDEPENDENCE is on press now, and ships June 16. It’s an incredibly dense, fascinating read, covering the entire 15-year history of the company. It features interviews with the Image founders, plus several of the newer creators working there, like Jeff Scott Campbell and Robert Kirkman. George Khoury was just interviewed about it on Comic Geek Speak; check out George’s interview, and the book when it ships next week. If a grizzled old-time fan like me can be riveted by the behind-the-scenes story of these young upstarts, you can be sure you will be too. This entry was posted in TNT on 6 June 2007 by Mr. Morrow. 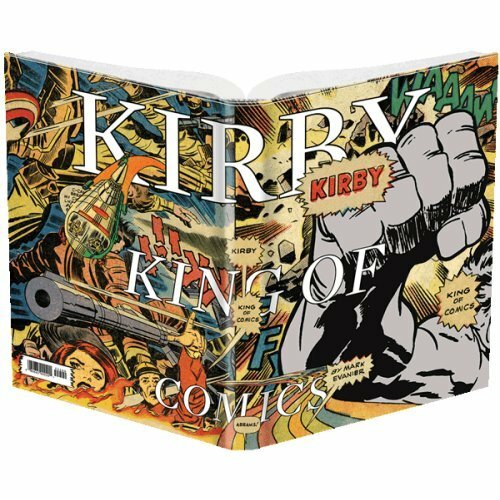 While at Book Expo last weekend, I got a chance to stop by the Abrams Books booth to see a preview of Mark Evanier’s upcoming book KIRBY: KING OF COMICS. The dummy copy on display only had about 8 pages of actual content (the rest of the pages were blank–a common practice for exhibiting books that aren’t printed yet at trade shows), but it gives a really nice sneak peak at what looks to be a must-have item for any comics fan, and a great vehicle to teach the rest of the world who Jack Kirby was, and what he contributed to comics, and popular culture in general. Abrams was giving away full-color posters of the dust jacket, and below is the cover. You can preorder it at Amazon.com now by clicking here. It’s due out in October, and looks to be a bargain at the $40 price. This entry was posted in TNT on 5 June 2007 by Mr. Morrow.